My work focused on the development and implementation of a unified theory and design algorithms for the simultaneous design of high frequency 3-D Integrated Circuits and Antennas. In this development my students and I pioneered the methodology to treat 3-D circuits as radiating elements at discontinuities and interconnects thereby allowing the accurate modeling of cross talk and substrate material effects. To achieve this goal we “cracked” for the first time the solution of Integral Equations with improper integrands. Our contributions with this part of her work have had and are having a fundamental impact in communication technologies such as in 3-D integrated circuit and antenna design, especially for wireless communications. In addition we took our experiences further to design micro machined circuits and integrating packaging for the design of high performance circuits in high frequencies. We designed circuits on thin membranes for low losses and we constructed high-Q micro-machined circuits in high frequencies to demonstrate excellent performance. Our designs in three-dimensions demonstrated that highly integrated circuits can outperform planar circuits thus providing smaller volume, lower cost and better performance. These techniques have now been adopted by the defence and commercial industries. My group and I specialized in design and characterization (theoretical and experimental) of microwave, millime­ter printed circuits; the computer-aided design of VLSI interconnects; the development and characterization of micro-machined circuits for microwave, millimeter-wave and sub-­millimeter-wave applications including MEMS switches, high-Q evanescent mode filters and MEMS devices for circuit re-configurability; the development of low-loss lines for sub-millimeter-wave and terahertz frequency applications; theoretical and experimental study of unipla­nar circuits for hybrid-monolithic and monolithic oscillator, amplifier and mixer applica­tions; theoretical and experimental characterization of photonic band-gap materials. In the following, I am presenting some of our most interesting projects. The power cube was a demonstration of the ability to integrate in three dimensions while improving quality of performance and complexity of functionality. The power cube was the first demonstration o fa receive transmit module in W band. Out work was done in collaboration with Ratheon and funded by DARPA to demonstrate that high integration could also lead to better performance while reducing space and cost. What we proposed led to the development of a 64 element array that was fed from the back by a highly integrated transmit/receive module. Th vertically integrated feed networks reduced losses substantially while allowing for better performance. The schematic on the left shows one of the many possibilities to provide such a vertical integration. This particular design was proposed for an array of nano satellites. Katehi has been a pioneer in studying high-frequency effects on planar circuits and understanding parasitic radiation, substrate-wave propagation, and the importance of high-frequency parasitic phenomena on the performance of planar circuits. Her work demonstrated that 3-D integration is the approach to achieve high performance in high frequencies. In pursue of fully integrated three-dimensional circuit architectures and on-wafer packaging, she explored for the first time the use of Si-micro-machining in circuit design. Katehi developed three dimensional circuit integration architectures and on wafer packaging that have been adopted by industry as the architecture for the next generation of high-frequency circuits. 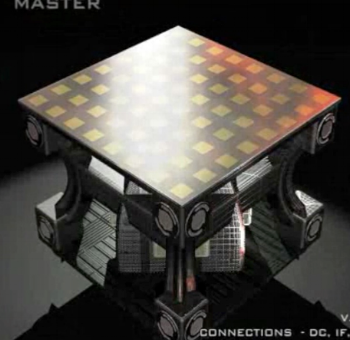 Based on Katehi’s work DARPA funded four major research and development programs, MAFET III, IRFFE, MERFS and SMART, of a total of $200M to demonstrate 3-D circuit architectures on receive and transmit systems operating between 2Ghz and 94GHz. Furthermore, the defense industry is now using the architectures pioneered by Prof. Katehi to develop the RF front ends of the next generation of military sensors such as XG, JTRS, GPS-Guided Munitions. Specifically, Lincoln Labs and Northrop Grumman have adopted the on-wafer packaging for RF MEMS which was demonstrate by Katehi’s work and Raytheon and Rockwell Collins used these three-dimensional interconnects for their reconfigurable high-frequency RF systems. Prof. Katehi’s fundamental designs have been incorporated in the development of new systems worth a total of $1B-$10B in the defense economy and due to substantial gains in size and performance have provided savings of many hundreds of million of dollars in the cost of these systems.